Limited Edition Feathersteel Blade forged by Master Michael Ye mounted in custom bronze fittings by Jeffrey J. Robinson. 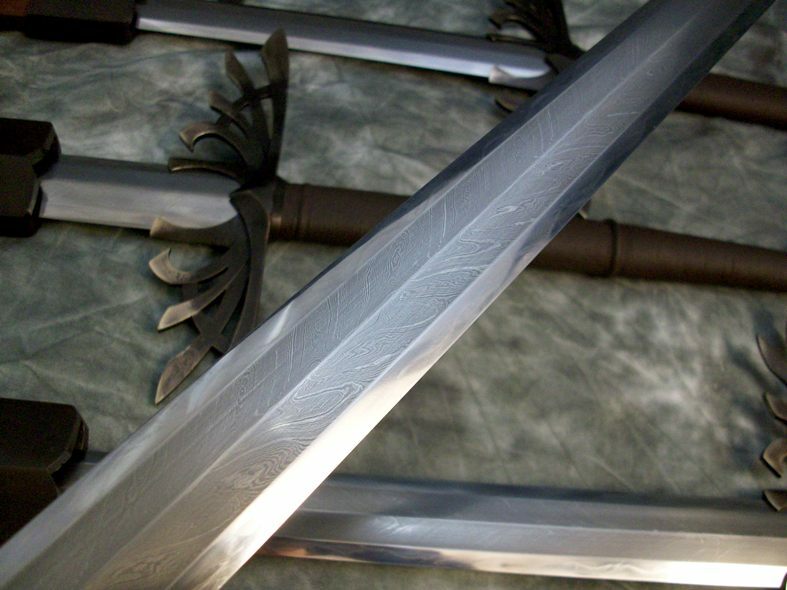 This highly collectible, premium quality sword is an original piece of fully functional Fantasy Sword Art made as part of the Legendary Swords Project. First the blade is hand forged by Master Smith Michael Ye at his forge in Longquan using a rare and little known technique to produce what is known a as a Feathersteel or Windsteel blade - a powerful Octagonal profiled length of steel with differentially hardened egdes and a unique 'windswept' patterning that looks somewhat like a feather, hence its name. Then the bare blade and bare rosewood scabbards are fully mounted in original custom bronze fittings made by artisan and sword maker Jeffrey J. Robinson to create a unique collaboration and results in one of the finest swords we have ever presented to the truly discerning collector. 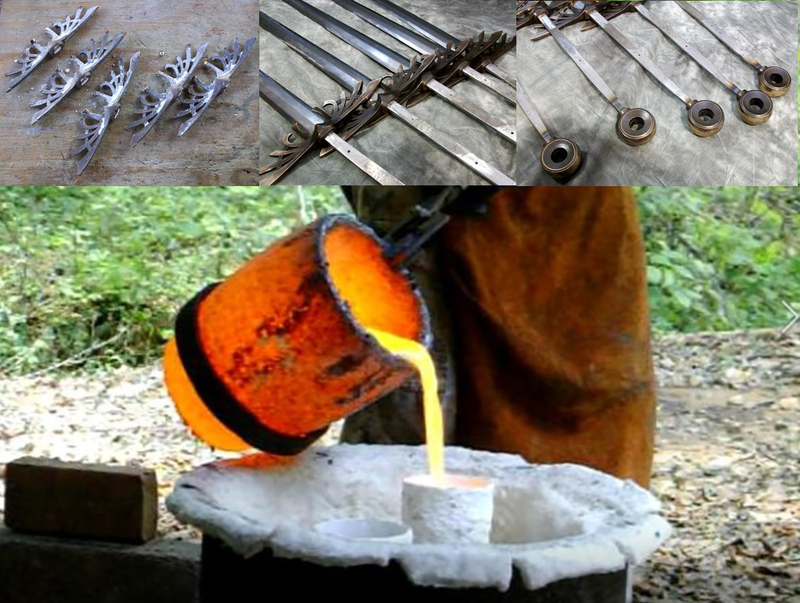 You can read a lot more about how this project came about and see pictures of the original prototype being made, as well as a deep and rich backstory here at Legendary Swords.com (link opens in a new window). But while it is clearly beautiful and expertly constructed (Jeffrey also creates new wood core, leather lined handles and 'banzai peens' the pommel permanently in place) make no mistake, this sword is a powerful and very durable two handed cutting machine - and Master Ye's Feathesteel blades have been destructive tested and are capable of turning a Viking style shield into woodchips (click here for the YouTube Video). Rare, deadly and gorgeous to look upon, from the rich contrast of the wood and bronze to the unique pattern in every blade (like a fingerprint, no two are alike). Long ago, in the age after the creation but before the fall, we lived in light and splendor. We knew no suffering or distress and felt only the warm embrace of the radiance which surrounded us. All was solace and serenity. In time though, there would be one among us within whom grew the barbed seeds of envy and pride. Fealty to the light pricked at him like a nettle in his mind. He would not serve and sought the dominion he believed was his due. An insurrection was mounted. And so each had to choose, as choice was part of our great gift. We would serve and defend the light or we would join the revolt against it. Most chose the light, but to our dismay, a multitude allied with the apostate. Open war came then, between the light and the dark. We were ablaze with the righteous luminance within us and the devotion of our brothers and sisters alongside. But those who chose the dark grew ferociously twisted and corrupt in the shadows. They knew no mercy or compassion, which made them fearsome antagonists. We cast them out from the firmament but could do no more against them. With every assault, their rage seemed to grow and our defenses diminish. We were losing. Decisive action was imperative. We would take the fray to them where they had made their enclave on the mortal world; a world we had long gently guided and nurtured but never tread. A score of us were chosen to lead the foray to the corporeal sphere, far from the shining empyrean. We devised a plan to sway the course and turn back the tide; we would each take a part of ourselves, a shard of our very existence, and from these pieces, forge implements of war. A sword for each, containing a discrete part of our light divorced from our marrow. In this way, we hoped to have the means to beat back the onslaught without contaminating ourselves with its corrupting veil. We met the enemy on the field of war, the bare earth and rock itself a denigration to our feet, unaccustomed to so base a sensation. In the mayhem that ensued we held the betrayers at bay, for a time. The bright spark of our determination turned to ash as, one by one, we were overwhelmed and began to fall. A fear surged up within us then, not a fear of pain or of death, but of the darkness overwhelming all and swallowing the light in formless oblivion. The end of all things, it seemed, was imminent. But then something we had not expected occurred. Men, men who we had thought of as but precocious children, came to our aid. From the sidelines they picked up our fallen arms and stood over the wreckage of our broken bodies and defended us from the deprivations of the enemy. They did something we could not; they held the line. It cost them more than I can say. They fell by the side in tens… in hundreds… in thousands. But they kept on, young, old, man, and woman, and did not falter. Men, whose brief existence from birth to death was like a single breath to us, their sacrifice all the more significant because of the brevity of their brightly burning flames. And then they did more; they pushed the line back. They drove off the waves of darkness which retreated to the coldest, blackest places. A fervor welled within us then, because, though our own substance was at its end, we knew the light would never fail as long as there were Men. They had a valor we had not imagined. Though they had never been within the radiance of the light as we had, they defended it still. Though the darkness crept among them, they would not succumb to it. The pieces of us we left on the field were now in the care of Men. A part of us that would always be with them. Together we would protect the light. A complete package, the Seraph Aegis from the Legendary Swords Project takes a high end Feathersteel (also known as Windsteel) blade made by Master Michael Ye in Longquan and then its handed over to Sword Maker and Artisan in Bronze Jeffrey J. Robinson, where he mounts it all up in hand made bronze fittings themed to compliment the 'feathered' steel so that it represents the wings of the powerful angelic being who first created it. 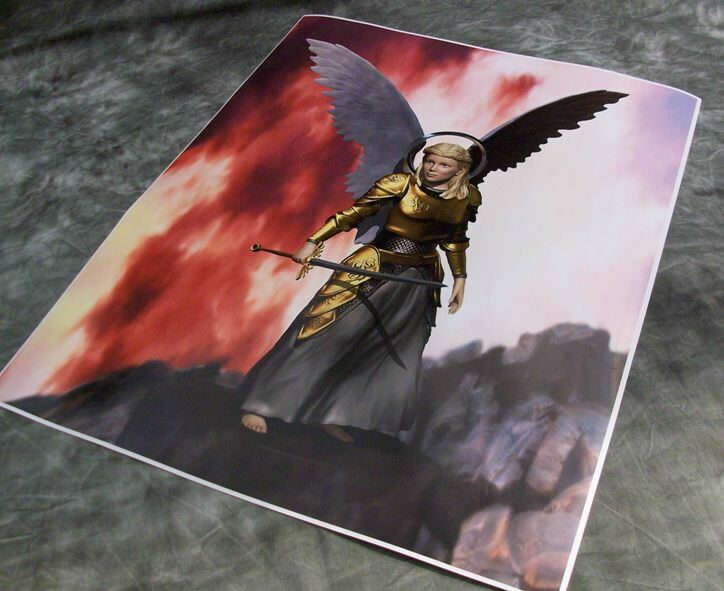 Each purchase includes a custom made scabbard, also mounted in original bronze fittings, as well as a complimentary signed poster of the original Seraphim bearer created by Jeffrey R Robinson (pictured left). Master Smith forged Feathersteel Blade with wood core leather wrapped handle and original hand made bronze fittings by Jeffrey J. Robinson. Includes Rosewood scabbard also with custom bronze throat and chape by Jeffrey..